BBC NEWS | Business | Could it happen here? For the past few years, a key part of the American Dream has been a lot more widely available. For people with no proof of their earnings, poor credit ratings, or without a deposit, owning a home used to be beyond reach. The explosion of sub-prime lending changed all that. With mortgage brokers multiplying, clamouring for business, nothing seemed impossible. No proof of income? No problem - no-document mortgages are there for you. Can't afford even the interest payments? Don't worry - just let the interest stack up for the first couple of years, and then remortgage on the back of the ever-rising value of your home. And then, quite suddenly, it all collapsed. 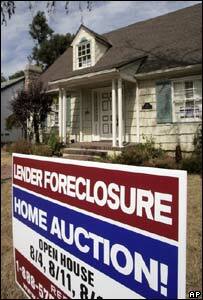 Amid a "perfect storm" of soaring interest rates and sinking house prices, lenders are going bust, loans are harder to come by and foreclosure numbers are going through the roof. The after-effects are rolling around the world, to be seen in gyrating stock markets and a sharp credit crunch. What went wrong? And could the sub-prime bubble burst here in the UK - as it has in the US? On the surface, there certainly seem to be worrying parallels. After years of breakneck growth across much of the UK, house prices may finally be coming off the boil. Hometrack's August survey found London to be the only part of the UK which showed any rise in prices from the previous month. UK interest rates, meanwhile, have gone up five times since the middle of last year, with Bank of England governor Mervyn King hinting that a further rise, to 6%, may be imminent. High Street banks are collectively setting aside hundreds of millions to cover their exposure to sub-prime. Step away from the macroeconomics, however, and the distinctions between housing markets on either side of the Atlantic become more apparent. For a start, there is a difference in definitions. In the US, sub-prime encompasses not just loans to people with a poor credit history, thanks to missed repayments or court judgements. It also includes so-called "no-doc" or "low-doc" loans to people without evidence of earnings, as well as loans for 100% - or even more - of a property's value. Taken together, sub-prime - and a "grey area" of what are dubbed "near-prime" loans - adds up to about a quarter of overall mortgage lending. In the UK, the term sub-prime only applies to "adverse credit lending". Last year, the Council of Mortgage Lenders estimated that by this definition sub-prime accounted for about 6% of the UK market - but is now redoing the figures, to take into account growing numbers of new lenders. The real number, according to Ray Boulger of mortgage brokers John Charcol, is probably closer to 9%, or about £30bn a year. Then again, there is the question of oversight. Much of the boom in US sub-prime lending was driven by armies of mortgage brokers, paid on commission and - in a majority of the 50 US states - without official supervision. In the UK, as Mr Boulger points out, mortgage lenders and brokers all have to be regulated by the Financial Services Authority (FSA). Not that that wipes out risk altogether. Recent FSA research indicated that numerous lenders and intermediaries were taking short-cuts when it came to sub-prime loans. "The high level of sub-prime arrears in a benign market" - as it appeared to be when the research was under way - "raises some important questions about the consideration given to affordability," said Clive Briault, the FSA's managing director of retail markets. But at least someone is looking at the problem. In much of the US, not even that much was true. But if there is one factor which, more than any other, has driven the contagion from the US sub-prime sector into the rest of the financial world, it is the way lenders raised the money they needed to keep lending. In the old days, mortgages were simple. Banks took deposits from savers, then lent that money out to borrowers. Their profits, in the main, came from the difference in interest rates between the two. And if times were tough, borrowers had someone to talk to about rescheduling payments and avoiding delinquency. In comparison to the way US mortgages work today, this looks impossibly quaint. The last thing a modern lender wants to do is keep a loan on the books. Instead, transactions ripple rapidly down a chain. The broker arranges the deal, which the lender pays out in money borrowed on the markets - or, sometimes, still from its own deposits. Then, as quickly as possible, the lender sells the loan on, to be packaged up with thousands of others into a "mortgage-backed security" - which, in turn, is sliced up into chunks, assigned levels of risk, and repackaged once more. So any given sub-prime mortgage will potentially end up scattered around countless portfolios as part of a string of what are called collateralised debt obligations. However complex this sounds, the theory is that in this way any problems with loans are spread across the whole market, rather than landing with a thud on the balance sheet of the original lender. Unfortunately, it now appears that the risks attached to much of the debt were vastly under-estimated, leaving it so "toxic" that no-one wants to touch it. So sharing out the risk by securitisation - as it is known - may have amplified the problem rather than reducing it, triggering the sharp contraction in credit which is now sweeping through markets around the world. In the UK, the old way still dominates. Most of the High Street lenders are still using their own balance sheet for much of their mortgages. For them, lending may be turning more cautious - but there is less risk of a crunch. 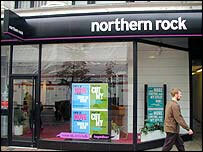 Still, for those that do turn to the money markets - like the Northern Rock bank, which sources 75% of its mortgage funding from there - things are more problematic, and lending criteria and available interest rates are becoming more onerous. So will stronger regulation, more conservative lending - and, incidentally, a tighter housing market where many fewer new homes are built - keep the UK insulated from the risk of sub-prime contagion? "The worst-case scenario," says Ray Boulger, "would be interest rates rising just as property prices fall." That, after all, is what happened in the UK's last housing market crunch in the early 1990s. With debt levels much higher now than they were then, we may be more exposed. But the credit crunch could relieve the pressure on the Bank of England to push interest rates higher, as could the prospect of flagging house prices. "I see prices flatlining for the next year or so, on a national basis," Mr Boulger says. "But unless they fall really quite sharply, we should avoid the major problems the US has seen."